The idea of being an empath is one that is becoming more widely known and accepted. What a lot of people don’t understand is that being an empath is tough. It’s not a simple sensitivity to emotional input from others, it is a mental and physical rollercoaster. 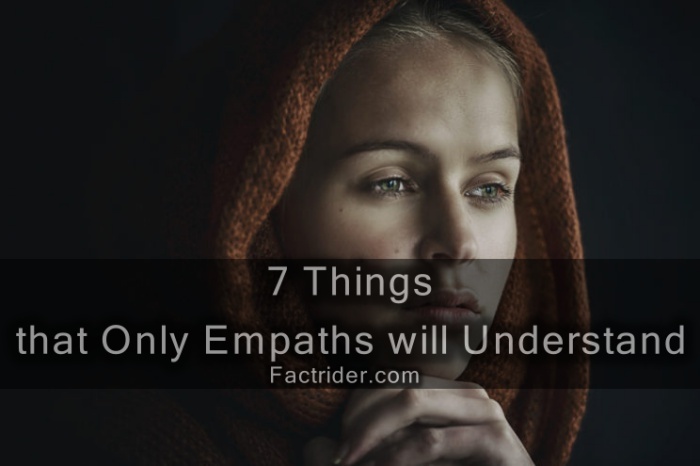 Empaths feel more deeply on a physical, spiritual, and emotional level – for good or bad. As an empath who struggles with these feelings every day, I want you to know that if you’re an empath – you are not alone. HERE ARE 7 THINGS THAT FELLOW EMPATHS WILL KNOW ALL TOO WELL. As an empath, there are times that you just know things. I don’t mean you have an intuition about something, I mean you just know it. There is no explanation, and often times it can lead to even deeper feelings of alienation. Whether it is a conversation about a concept you may not have experience with or someone talking about a particular situation, there are times that you just know things that you can’t explain. Being an empath can be exhausting. When you bear the emotional weight of people around you, that takes a toll on your body in a physical way. It can be hard to explain to people why you are always exhausted because often times we don’t understand it ourselves. You find that when you disconnect from the world, you find rest and refreshment. As an empath, you naturally take on other people’s emotions around you, even when you don’t want to. It’s not something you can control, it just happens. Other people can pick up on this, and you often times get into deep conversations with complete strangers that can add to that emotional burden. As an empath, you notice intentions in other people’s behaviors that they might not even recognize themselves. This is most obvious when it comes to people that are passive-aggressive, or “cat people”, as I call them. When someone does something that is seemingly innocuous to others, you understand the intentions behind their actions – and it can be incredibly frustrating. As an empath, you find it incredibly hard to do things you don’t want to do. In your eyes it is all or none – you either give 100% into something, or you don’t do it at all. This is a weird concept for others to understand because so many people go through life half-heartedly. This makes things like relationships tricky because you either move too fast or not at all. As an empath, you are always learning, reading, growing, and seeking answers to life’s questions. Leaving stones unturned can drive you crazy. This also can lead to a scenario where you re-think decisions, choices, and life in general. Regret is a strong impulse with empaths, but can be a dangerous road to travel down. Many empaths are perceived as moody, which isn’t far from the truth. The truth is, that as an empath you don’t always control your emotional state because of the emotional baggage from others that you tote around. If you have a depressing work life, your friends from outside of work may not realize why you are in a bad mood and vice versa. It’s an awkward balancing act at times.